It has been four years since the US introduction of the first generation of Testo refrigeration products. Our new generation of the Testo line of refrigeration system analyzers (RSA’s) will continue to change the way the HVAC/R world troubleshoots, commissions and services AC & refrigeration systems. Although the first generation of refrigerant products was highly successful, Testo has listened to our customers’ desires to develop a product line with the diversity to meet your most demanding applications. Testo has completely retooled and reworked the refrigeration product design from the hook, which is now a quick locking carbineer, to a backlit sight glass that aids in refrigerant recovery allowing the technician to see when the last drops of liquid refrigerant are removed. Larger valve handles that can be recessed or extended make it easier for large or small hands to operate the gauge porting, and valves that can be field serviced or replaced without the need for special tools. Leading the refrigeration industry in innovative technology, Testo will again surpass your expectations in digital refrigeration technology. The next generation has incorporated a long list of new features that will increase measurement accuracy, reduce equipment-servicing time, and provide a means of tamperproof field verification, while streamlining field operations. Added this year in all instruments is the ability to print the measurement results on site via wireless printer, high stability ceramic relative pressure transducers, a large backlit display, and intuitive user operation. Three and four valve designs are available with a 3/8-evacuation port on four valve manifolds. High durability valve handles with Teflon seats, a backlit sight glass, and display, hose holder with integrated LCD protection, and in 556/560 models wireless temperature sensors and data logging. Incorporated into the 560 is also a vacuum sensor that reads in microns, “hg, or Pascal’s of pressure. With its data storage capabilities (556/560), USB output, real-time graphic capabilities in the online mode, joined with the superior accuracy, no other product made can compete at any level. After several years of rigorous testing in the lab and the field, the digital manifold has been proven to deliver laboratory accuracy results in demanding field service. The multi-functionality, reliability, repeatability, and unique features set the Testo products apart from the competition. Technicians will appreciate the ease of use, the wide range of applications, including the ability to upgrade to new refrigerants along with the wireless printing capabilities on all instruments from the Testo 523 to the Testo 556/560. Small features like an integrated protective boot and lighter yet more robust design has not been overlooked on all models. Future accessories for the 556/560 models including a wide variety of temperature probes, digital scale, amp clamp, and oil pressure transducer allow for quick verification of proper operation and field documentation or real-time monitoring and troubleshooting. Pressure-temperatures chart are a thing of the past, and commissioning equipment to anything less than the manufacturer’s standard will become uncommon for all Testo users. Technicians can get more done with higher accuracy and quicker results than ever possible. Field documentation can be done with little effort, providing any interested party with the information needed to evaluate system operation in the field or the office. Testo has taken a quantum leap forward in AC/R measurements allowing anyone from the lab technician to the service technician to deliver consistently accurate results to owners, manufacturers and end users of air conditioning and refrigeration equipment The Testo 523/556/560 digital refrigeration/air conditioning system analyzers are a multipurpose tool designed for every day use replacing a gauge manifold, superheat or subcooling thermometers, Pressure-Temperature charts, etc.. with a rugged hand held versatile tool. Unlike traditional mechanical gauge sets, the Testo 523/556/560 has dual ceramic pressure transducers or pressure-measuring sensors; an advantageously used pressure measurement technology. Ceramic pressure-measuring cells have a measuring accuracy and repeatability that is stable over a very long time; therefore frequent calibration is not needed. The high and low side sensors are selected for an operating range that will provide the highest accuracy for their desired measuring range, allowing accurate pressure measurement over the full range on either side. (.5%fs) The different range of pressure transducers for the high and low sides respectively are calibrated in regards to their zero points, coefficient of thermal expansion, and sensitivity so they can be used in wide ranges of temperatures as extra-high precision pressure transducers. Ceramic pressure transducers are designed so the pressure sensitive part is exposed directly to the measured media. Thanks to excellent chemical resistance, ceramic pressure transducers do not require additional protection from oils, refrigerants, or acids and additionally will withstand the shocks from normal to rough handling without ever affecting the sensor calibration. While traditional gauges require frequent trips to a calibration house to assure their accuracy (often a procedure never performed), the calibration of the pressure transducers in the 523/556/560 is only recommended annually. The ceramic pressure transducers or sensors can be field nulled, (often referred to as zeroing) and as good practice should be whenever refrigerant pressure is removed from the sensors, or when the hoses are purged to change refrigerant types. A null value is different than having a value of 0, since 0 is an actual value. When a variable has no value, it considered being null. Because all standard pressure gauges are calibrated for sea level, (0 psig) if the sensor was zeroed rather than nulled, the current atmospheric conditions would not be considered. If the gauges were brought back to 0 psig outside of sea level, (a procedure often performed with mechanical gauges and some electronic) the accuracy of the gauge would be affected by the current elevation with respect to sea level. Because Testo uses a nulling procedure rather than zeroing, the instrument the sensor can be brought back into calibration in relation to the current atmospheric conditions or ambient pressure, which thus serves as a reference pressure. Quite simply, when there is no refrigerant pressure on the sensor, the reference pressure and the sensed pressure are the same. Nulling the RSA sensor brings it back to a perfect zero psig regardless of the atmospheric conditions provided the pressure is removed from the sensors. Thirty on board temperature pressure charts provide unparalleled detail and accuracy of refrigerant saturation temperatures, superheat and subcooling. Unlike traditional paper charts no interpolation of the temperature-pressure relationship is required. It is now possible to measure and set superheat and subcooling with laboratory accuracy in the field as the Testo 523/556/560 reads pressures and temperatures to the tenth of a psi and tenth of a degree and automatically calculates real-time superheat and subcooling values. 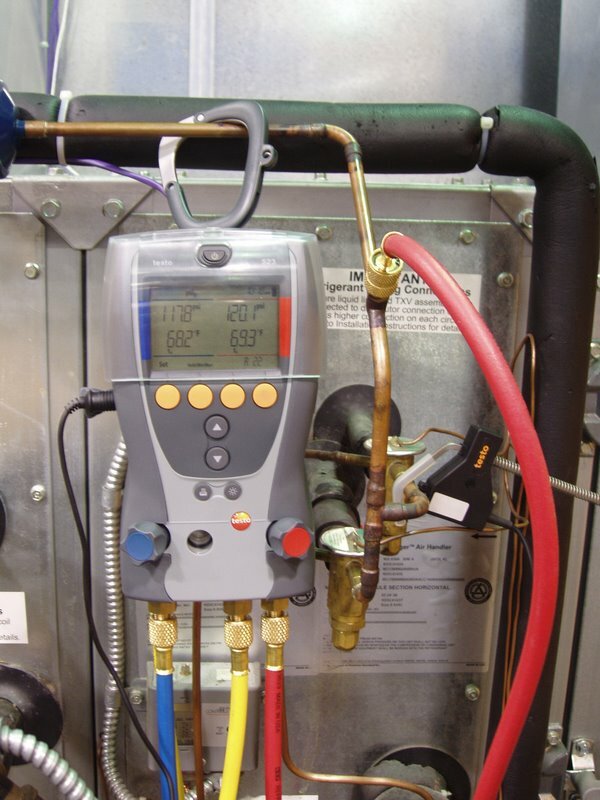 Temperature measurement is just as critical as temperature when commissioning and servicing equipment. The platinum based (platinum film on a ceramic substrate) 4-wire construction, of the spring loaded temperature sensor (Pt-100) has a very low mass (yielding a fast response) and is not affected by stray voltages that may be present on the refrigeration equipment. Unlike traditional K-type thermocouples, the sensor is electrically isolated from the RSA. Isolating the temperature sensor electrically form the system eliminates the possibility of incorrect temperature measurement resulting from stray electrical currents or ghost voltages often present on improperly grounded refrigeration and air conditioning systems. Because the resistance of a Pt100 sensor bears an absolute relationship to temperature (unlike a thermocouple whose output depends on the difference between the hot junction and cold junction) no special compensating circuit needs to be provided in the electronics. In short, the Pt100 has a wide operating range, excellent accuracy, good linearity, excellent physical strength, long-term stability, and is the preferred sensor for all industrial processes where accuracy and repeatability are required. Additionally, Pt100 probes may be replaced without recalibration of the RSA instruments. Sensors are available in lengths up to 40 feet. The Velcro-elastic strap provides insulation from ambient air along with positive contact to the refrigeration line from ¼” to 3” in diameter. Air and immersion probes are available to further enhance your testing applications. Additionally incorporated into the system analyzer is a new dimension; time. The entire new generation of RSA products incorporates a real time clock that permits accurate documentation of the time and date readings were recorded via the wireless printer or data logging. 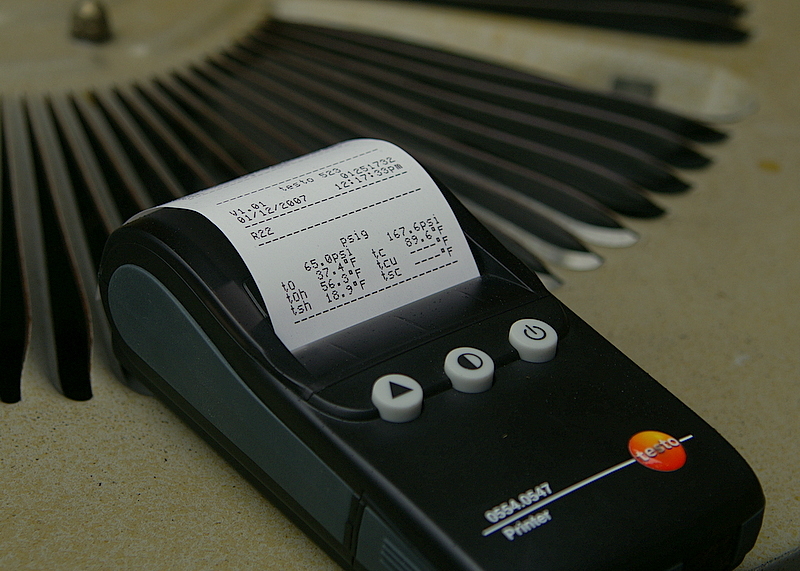 Testo was first-to-market with a complete line of refrigeration system analyzers that incorporate data logging, and now the first to bring wireless printing to the complete line. Owners of Testo combustion or other test equipment that already use a wireless printer will benefit from cost savings, as the printer is universal to all Testo products. Data logging (556/560) allows the service technician and or system analyst to evaluate system performance over a period of time from a snapshot to days with easy to use software, A printout of the final operating parameters on all RSA products allows for field documentation of operating at system startup or pre and post operation. The Testo 556/560 are both upgradeable to wireless temperature capability. Wireless technology will enable temperature measurement form remote locations for calculation of evaporator superheat at an outdoor condenser, monitoring of return and supply air temperatures for outside, or a remote outdoor air temperature. The wireless probes and the built in temperature probes can be assigned as needed for a number of field applications. Wireless printing is standard in all models of the new generation of refrigeration analyzers. All measured and calculated parameters can quickly be field documented without error in seconds. Pre and post measurements allow for documentation of “as found” and “final” performance. System commissioning on new startups or major component repairs like compressor replacement are easily documented for the office and the customer. The most significant advantages of data management and analysis are apparent when data from a Testo 556/560 is read, analyzed and managed in the Testo PC Software. It is now possible for the technician designer, engineer, service manager, or a lead technician to spot trends, benchmark systems, verify proper/design operation, provide real-time system operation to a manufacturer or other interested party in an tamperproof data format that can be graphed to provide a “digital window” into the refrigeration/air conditioning system. In the online mode, system high and low side pressures, saturation pressures, measured temperatures, along with superheat and subcooling can be viewed on an auto-scaling graph real time graphing format. All measurements or each individual measurement can be viewed at once. System hunting, erratic operation, or other trends can be quickly spotted and documented using the optional software. Testo has not overlooked small, but important details that make the products well suited for field use. Owners of Testo products have come to expect a rugged field service product with such features as water and acid resistance construction, a backlit displays and sight glass, user selectable units, and a battery life indicator to provide flexibility and reliability in their work.